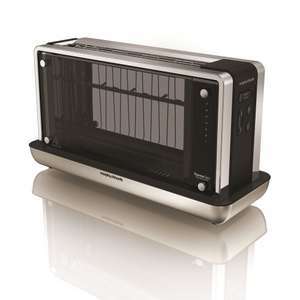 Not a deal for everyone at this price but anybody fancying this glass toaster can get it delivered for £63.99. Other retailers selling from £89.99 right through to over £200. Gets great reviews for a stylish gadget. Trustedreviews reviewed it at £199. use code VC20 for 20% Black Friday discount. Fundamentally flawed, but that is true of all these glass toasters. I have tried numerous brands and models, and not one of them actually toasts glass. Has it got Freeview HD? Heat added. Is there a kettle to match? How do you clean the glass? Dishwasher? Just want me bread hot & crunchy without a bank loan! Is that too much to ask?!?! Works out at £95.99 for the set (after discount code) plus possibly 10% quidco. Yes, not cheap, but if you're getting the toaster and want the matching kettle too, it's a good deal. I've ordered. Lidl had their version much cheaper and as they couldn't shift them went an extra 25% off think they where 20-25 by the end. Glass toaster, well I never, whatever next. Thanks OP, I didn't know glass toasters were actually a thing. Though I'm still unsure why you'd want a toaster made of glass ? Glass toaster, well I never, whatever next. Thanks OP, I didn't know glass …Glass toaster, well I never, whatever next. Thanks OP, I didn't know glass toasters were actually a thing. Though I'm still unsure why you'd want a toaster made of glass ? To get your browness nailed. Fundamentally flawed, but that is true of all these glass toasters.I have …Fundamentally flawed, but that is true of all these glass toasters.I have tried numerous brands and models, and not one of them actually toasts glass. You're using the wrong type of glass. Clearly. Price compared to RRP Is hot no doubt abt it but £200 for a toaster? …Price compared to RRP Is hot no doubt abt it but £200 for a toaster? Jeez...Just want me bread hot & crunchy without a bank loan! Is that too much to ask?!?! Does it do the weather app? Also tells you how long is left before it pops. That’s got to be worth the price of admission alone! who spends £64 on a toaster? Its to keep the kids entertained after CBBies shuts down for the night. Read them a story instead! Purchased kettle and toaster. Thanks OP. Read? As in Book?? How very 20th century of you.